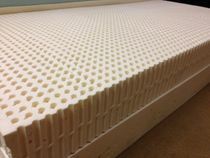 If you are looking to save a lot of money on building your own latex or spring mattress then let us help pass along our buying power to you. Latexco has offered us a super deal on their new Euro Mono Zoned Dunlop latex cores. Here's some of the features - European made 15% Natural, 85% Syn…. 100% Pure Latex Rubber with NO additives or non-latex FILLERS used. Mono Zone Dunlop latex design assures consistent feel and compression throughout. Available in Firm #36 ILD but when compared to Talalay latex feels more like #40 ILD. Medium #30 but feels like #34 Talalay, and Soft #24 and feels like #28 Talalay. … also same feature as all of our other Latexco products… Dust Mite Resistant, Anti-fungal, Anti-microbial, ECO friendly, bio-degradable, etc. 6" thick. 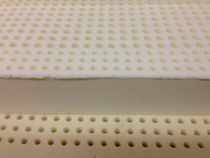 These European Mono Zoned Dunlop latex base cores are the main ingredient to any do-it-yourself latex mattress. They are heavy and built to last for decades. 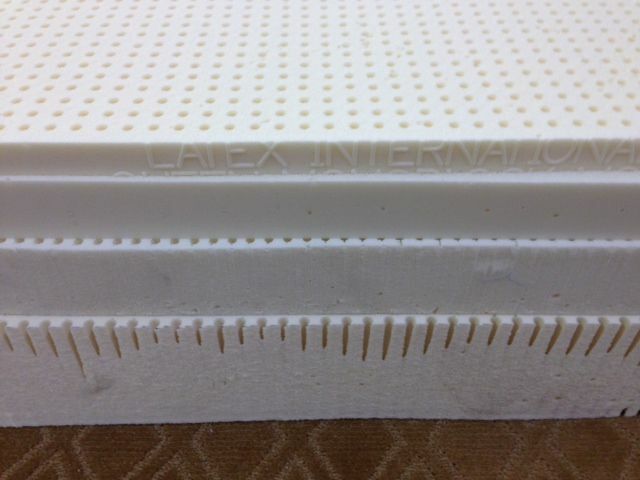 To make the perfect latex mattress you will need to add at least one and perhaps two soft toppers over these cores. For example, if you were looking for a similar feel to the Pure Latex Bliss "Beautiful" model you would select the "Firm" core. Over the core you would add a 3" #28 Talalay topper and over that a 3" #19 Talalay topper making up a total of 12" of latex. 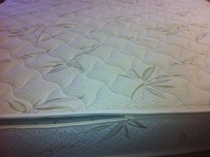 The queen size sold for around $3600. 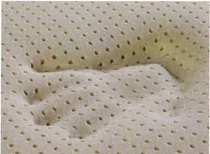 Using these "special buy" cores and adding one or two of our latex mattress toppers and then encasing them in one of our "replacement mattress covers" you can duplicate a similar mattress at less than half the cost, way less! If you were looking to Do-It-Yourself in a spring type mattress then our Combi-Zone Pocket Coil Spring is the ideal coil type base foundation. Just add some layers of latex for a completely customized feel. 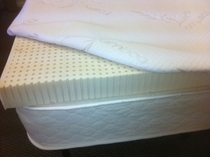 For a side sleeper you will need at least 3" of "soft" #19 over a "medium" or "Soft" core depending on your weight. For what I consider to be a "medium" feel I would just add a 2" #22 topper over the "medium" core or a 3" #28 topper over the "Firm" core for a firm feel. These are just suggestions but feel free to call us and pick our brains since no one has more experience selling latex mattresses online than we do. Of course you will still need to contain all these components in a nice zip cover which you can find in our "replacement mattress covers" category.